Submitted 5 months 3 weeks ago by bucks4life. 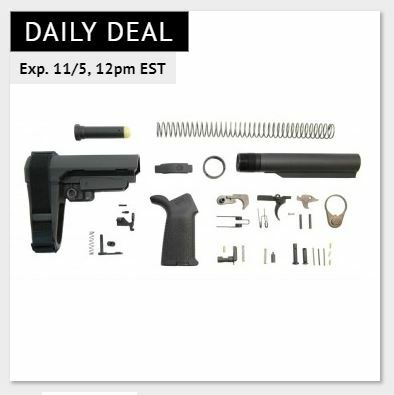 The PSA MOE SBA3 lower build kit includes everything needed to turn an AR-15 lower into a pistol conversion. The parts included are Magpul Original Equipment, which means you're AR pistol will be built to withstand a beating. The Magpul handle and trigger guard are optimal for ergonomic handling and operating, even with gloves on. The SBA3 brace is adjustable to 5 positions, and is designed for compatibility with nearly any AR pistol conversion capable of accepting a mil-spec carbine receiver extension. Palmetto State Armory lower build kits conveniently include everything necessary to quickly and easily complete conversion. Order yours today!